What follows is a repost of material I developed years ago for my Rolemaster game world and later published in an issue of Grey Worlds, the Rolemaster fanzine. Inspired by a conversation thread at the Kobold Press Midgard Facebook group I thought I'd post some background of my use of Elemental Planes. Another semester of teaching and instruction begins at the Arcane Guild in Tarna's capital city of Roim. These next weeks, the last semester of the year, just following the High Spring Festival, will prove to be unlike any other. Telengard, master mage and researcher, looks about the auditorium at the somewhat sparse crowd of students. "I trust your Festival was a fine and exciting day," Telengard remarks with obvious sarcasm, gesturing at the cracks across the walls and the piles of debris yet to be cleared from the corners of the hall. "The events of yesterday were brought about by the dieties and servants of the realm known as the Maelstrom. These beings sought to bring their power and beliefs to the world, over all others, but were defeated by the might of the Lords of Light and Dark as well as the awakened might of Arda, our world itself. The contest of power was won and the minions of the dieties of the Maelstrom were driven back to their Elemental Realms. It is this realm that we will discuss in detail over the next weeks, with particular attention to its geography and its inhabitants." 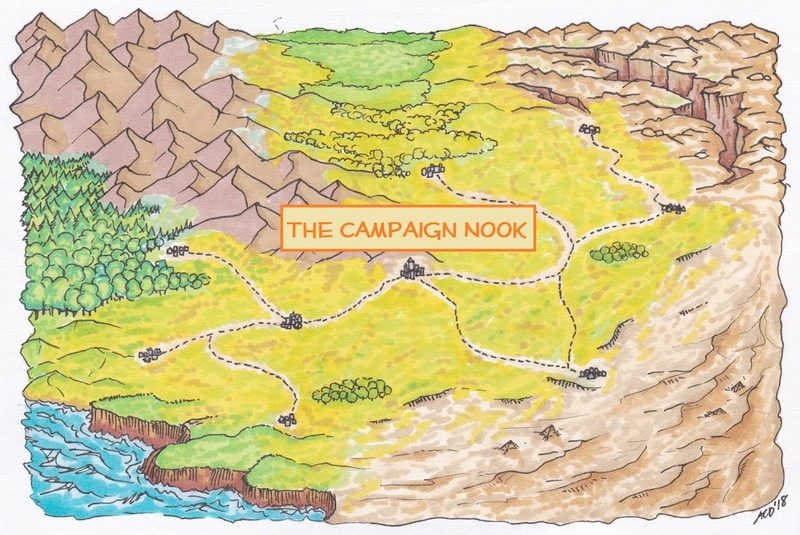 AUTHOR'S NOTE: What follows in this article ( and perhaps others ) are ideas, from an existing campaign setting, for the creation and integration of a realm of the elements. This article draws heavily from Elemental Companion ( EC ) as well as the Advanced Dungeons & Dragons supplement Manual of the Planes ( MotP, (c) 1987 TSR, Inc. ). I have included modifications and adaptations of material drawn from both sources. Note that I have rather liberally ignored the precise element descriptions from EC to form matches with the elements presented in MotP. Apologies to M.Carlyle and any others whose feathers I may ruffled with what might be a rather cavalier adaptation of the material. "Imagine, if you would, a globe of vast proportions surrounding Arda as well as Arien, the Sun, and Tilion, the Moon ( a misnomer for Tilion is much like Arien but that is a matter for other lectures ). Within that globe is our world, the gods and their realms. Outside of that globe is the Maelstrom. Now imagine another globe, bigger than the first but centered on the same point, Arien. I propose that the Maelstrom fills the gap between the first globe and the second while outside the second is what we call the Astral realms. Yet also outside the second is what we call the Etheral regions. And also the realms of the Spirits. From Arda we can access all three realms yet they do not exist in the same place. We occupy what might be called a Nexus between the Astral, Etheral and Spirit realities, subject to the influence of all yet affected by none." 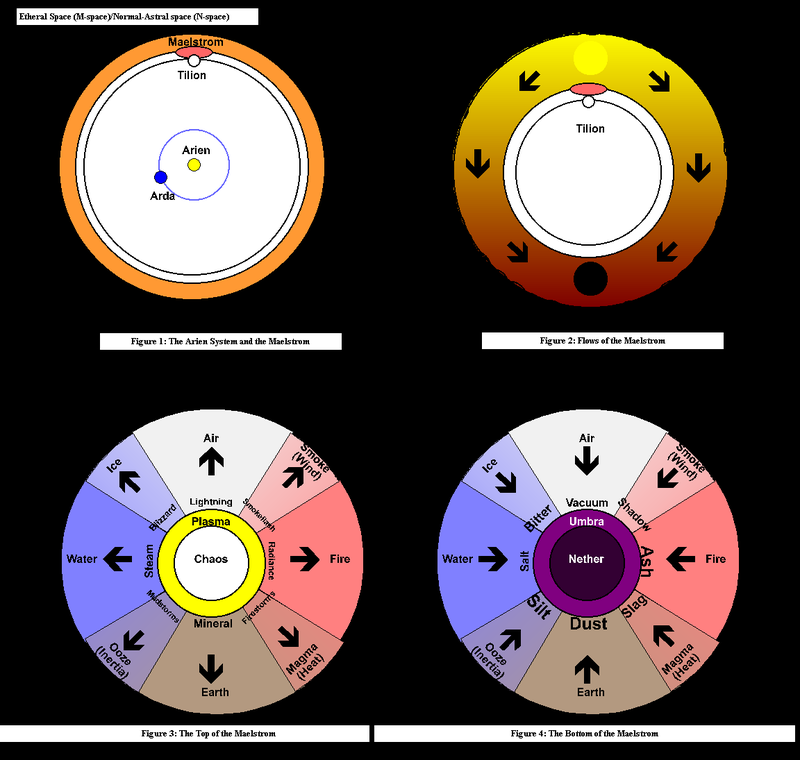 The campaign world of Arda is part of the Arien system, consisting of Arien, a G-type yellow star, and Tilion, a white dwarf. The entire star system is surrounded and separated from normal ( astral ) space by the Maelstrom. See Figure 1 for more information on Arda and its surrounds. the Astral, the Etheral and the Spiritual. Yet for what its name implies, one can find stable structures within it and there is a flow or method to its existence. There is a continual flow of Essence, of a vast power, from one point in the Maelstrom to another point directly across the spheres from the first. The ability of the first source to generate Essence ( or more precisely the more basic Arcane form of magic/mana ) never wavers and the ability of the second point to absorb or drain Essence never fails. Yet the Sorcerors, the Entropy Mages, tell us that perpetual processes can not exist, things tend to end or randomness. Are we in an anomaly, a cycle of magic which should not exist. What if the cycle were to end, would we return to whence we came or would the Nexus of Arda be snuffed like the candle I now snuff to end this first portion of the lecture." In normal space, the Maelstrom is a large gravitic anomaly and has been classified as a navigation hazard by local spacefaring cultures. It is also a potent emitter of some forms of radiation much like a large star. Every couple of years or so, an expedition is mounted into the Maelstrom. So far, none have returned. In actuality the expeditions are most likely destroyed by the Boundary Regions or by impact into Elemental matter. Figure 2 shows the flows of Essence within the structure of the Maelstrom. Returning to the hall after a brief break, Telengard begins anew, "The Maelstrom is a region between two spheres of great size, encompassing our world and the realms of the Gods as well. The borders of the Maelstrom is a hellish region of flows of time, gravity and nexuses affecting the unprepared traveler with shifts into the past or future, crushing stresses or slips to other realities. The "top" and "bottom" of the Maelstrom are the source, a region of expanding primal energy and condensing matter and elements, and the sink, a region of decaying matter and energy and absorbed primal energy. The realms of the elements are arrayed throughout the walls within the borders, fed by the source and drained by the sink." Figure 3 shows a view of the Maelstrom from the top with the Plane of Chaos in the center. Figure 4 shows a view of the Maelstrom from the bottom with the Plane of Nether in the center. Telengard closes his notes and peruses his students once more, "In my next lecture, we will consider the various creatures, cultures and specifically, the deities of the Maelstrom. I will also discuss spells and enchantments derived from the study of the Elements. I have finished for now but we are barely just begun. Those who have questions may reach me in the lounge for my office seems to have disappeared in the aftermath of this inconvenient business with the Maelstrom." With what actually might be a sigh, he turns and walks from the stage.